Fusing rustic and traditional styles, this Bench creates a refined look that is perfect for a casual or formal dining room. Made from solid pine wood in a rustic black pine finish, this bench features a fabric upholstered padded seat and back that is accented with nail head trim. Stretchers bolster the legs of this bench for stability and doubles as footrest to provide you and your guests a place to rest their feet. Add this bench on the longer sides of your table as dining seat or as an accent piece in your living room or entryway. Note: Other featured items in image except this Bench are sold separately. 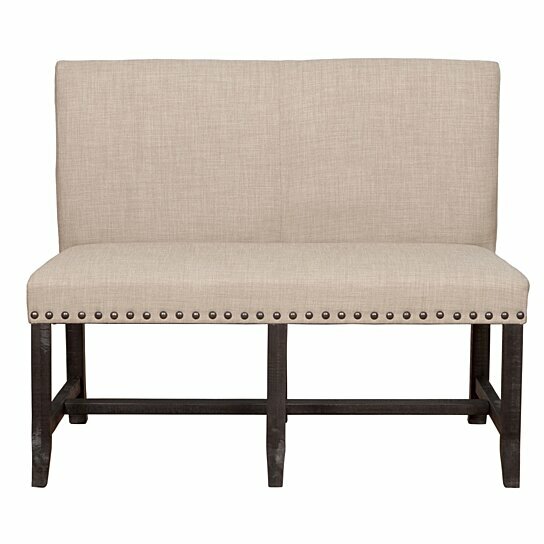 The bench features padded seat & back that are adorned with nail head trim. The frame of the bench is made from solid pine wood and is upholstered in soft fabric. The legs of the bench are bolstered by stretchers for stability.